Facebook has this quiz—you might know it—“14 Fun Questions to Ask Your Child,” and because I was supposed to be doing something else, I turned instead to my five-year-old son, and we proceeded down the list. When I got to number thirteen, “What do your parents do for a job?” my son hesitated. I can’t blame him. I’m a writer, but not the real kind, not like my playwright husband, who works every day even if our son is crying or the refrigerator is empty or the throw blanket is askew. He can jam out pages at the kitchen table as though he were staffing an executive desk, unaffected by the sapping need all around him, the everyday-ness that wanes my woman’s mind into a slip of something remembered, another item on tomorrow’s to-do list. This everyday-ness has a name, apparently: feminists call it “the mental load,” the invisible managerial responsibilities that ensure my family never runs out of toilet paper. Whatever you call it, my husband is the real writer, and I am sometime-y. The challenge of committing to the page is that writing requires time, gluts of time to hear nothing but your own words, to staff your chair as an independent agent and not a singular source of need. A lot of the time the mental load wins and dishes it is. But other times the writing in my head demands substance—there’s no saying no—and so I allow myself space on the page. Containing the truth is risky, after all. The stories that matter most are what we are reluctant to release, but keeping them subverted has the power to make us fearful. Once acknowledged, the truth will relinquish its stranglehold on us. A student in my most recent writing class defined creative nonfiction as the “BS without the bull.” When I asked her what she meant, she said, “We’re supposed to write about the worst thing that ever happened to us, right? That’s what you want. The bad stuff.” I laughed and told her that all of life was the bad stuff. And all of life was the good stuff. With enough years behind us, such distinctions disappear; the truth is complicated. Creative nonfiction honors such complexity, allowing us to study our own lives for meaning. On paper, our experience has weight and substance, distance and perspective. We have offered our stories meaning. And those stories can serve as the beginning of a longer, more profound evolution of thinking. So: what’s your story? When you’re alone, when it’s quiet and your mind wanders, what surfaces, over and over despite your best efforts? Psychologists call these “intrusive memories,” the invisible switchboard operations that ensure we never get over our childhoods. I call them “golden stories.” Not because they’re pleasant, necessarily, but because they burn bright. Imagine that every one of your memories is represented by a Polaroid in a photo album. Flip through the album, and you’ll find that some of the Polaroids are faded, unrecognizable, but others burn bright. These are the golden stories. It doesn’t matter if they’re fragmented or confusing or strange or blissful or even wrong. Maybe it’s a whispered conversation between your parents that you overheard at twelve years old, yet your parents swear that conversation never took place. Still, the memory surfaces. Our golden stories are rich with emotional consequence, which is why our bodies preserve them as precious matter. What is memory, after all, but the most devoted of teachers, nudging us backward so that we may move forward as fuller, more aware human beings? The beauty of creative nonfiction is that it honors memory, pushing us to consider our stories beyond their entertainment value and engage in a pointed catharsis, connecting seemingly unrelated moments from our past. When I first sat down to write, it was because I kept remembering the knives. At nineteen, I left college because my mom was diagnosed with major depression and needed a caretaker. I remember hiding the steak knives under my bed and her pill bottles in my pillowcase so that she couldn’t take her own life while I slept. The depression lasted five years, but I bailed for Chicago after one. Left Albuquerque and my mom and the doctors and went on to finish school and get a job and fall in love. They kept resurfacing, and even though all of me did not want to go back there in my mind, I had to. I wrote every day for two weeks. I cried while I wrote. Sometimes I went straight to bed afterward because I felt like a black hole, an unknowable body, isolated and bursting full. When I was done, I had written what someone would later tell me was a creative-nonfiction essay, and that I should submit it to a graduate writing program. I did. That’s how I came to study nonfiction. What a relief to give this revelation a name. Creative nonfiction? This was a thing that people did, like out in the open, without fear of spreading their business out in the street? That’s the way I grew up: a good Chicana doesn’t talk outside the house. I had to get over that taboo real fast, because my memory just wouldn’t let up. I knew I had to write, but I wasn’t convinced I was ready. There was the golden story about me secretly reading a boyfriend’s journal, the golden story about my terror of giving birth. I thought, “What will people think of me if I write that?” It took time, but I learned that if I was to be truly honest about my past, I had to get over my current self-perception. I couldn’t possibly know who I was until I confronted who I’d been. Artist Sabrina Ward Harrison stated: “I believe we must create what we most need to find. Trust the mess and the not knowing. This is the real part, the most interesting part. Write fast. Write everything. Art isn’t meant to be pretty. It is meant to evoke.” Of course, the stories that are truly consequential, the stories that I must retell myself, are fraught with doubt and insecurity. I’ve learned to write anyway. I’ve learned to write for the love of myself. I grab my laptop and make a choice for truth. I’m always choosing. Which mental load is it today? Man the kitchen table and forgo the rest, knowing that if I choose writing over housework, I’ll suffer the physical manifestation of my to-do list, evidence that I’m a bad wife, a bad mother, a bad Chicana? Or else forgo the writing and suffer the heat-hot psychological cargo of golden stories burning bright? It’s more complicated than I’m letting on, of course. There is no one or the other, just as there is no good or bad. Am I just a mom, or just a wife, or just a writer? All I can do is take a deep breath and try: try to get it all done without resentment; try to be honest and thoughtful and productive on the page, even if I’m out of practice; and most of all, try to not compare myself to my husband, because it’s simply not the same. It never will be. I’ve spent years panicking that my sometime-y writer status will demote another notch, and then what? But creative nonfiction is a journey-in-progress. There’s nothing romantic about it. It’s domestic and mundane, psychological and philosophical. Most of all, it’s hard. But it’s solid training in how to be present in our small lives, how to listen to our truth and the truth of others. We can write because we dare to, because it is healing, because it will teach us things we did not know about ourselves before we started to write. And when it gets to be too much, when the words weigh down, and we can’t summon the wisdom, we can always step away and wash another round of dishes. 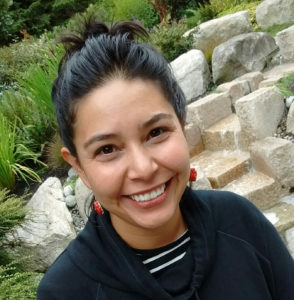 Felicia Rose Chavez is a digital storyteller whose work is featured regularly on National Public Radio. She holds an MFA in creative nonfiction from the University of Iowa. Former program director to Young Chicago Authors and founder of GirlSpeak, a literary webzine for young women, she teaches creative writing and new media as a Riley Scholar Fellow at Colorado College. Felicia, I loved this piece — the constant conflict between the writer and the mother. On so many days, the laundry, this dishes, the cooking and the running the kids around wins. Today, I sat down at my desk for the first time in five days. I put aside the other to do list and focused on the writing to do list. I worked on an essay. I sent an email to someone who offered to read some of my work and pulled that together. There is much left unfinished, but it’s a start. Last summer, our family visited a gorgeous garden, and I was delirious as I love to garden. My 11 year old looked at me and said, “You know, mom, you can’t be a writer and have a good garden. You have to make a choice.” He was not far off the mark. Writing is hard, but not writing is far worse. Felicia, this is absolutely wonderful. Just saved it to read to my students. Hug. And thanks. Feicia, you are an amazing writer.You present an open and honest evaluation of your innermost self in a fresh style. Your thought provoking expressions take me back to moments in my life. Thanks for your eloquent expressions. Beautiful, Felicia. It reminded me of my own child-rearing years, that delicate balance of need, between self and selflessness. You seem to be doing just fine. LOVED this. All of it. Thank you! This was amazing! You gave a name to my passion and I didn’t even know it had a name. Creative non fiction. And you captured the push and pull of life as a mom and wife who cannot imagine her life without writing. Thank you! Felicia – This piece is a very refreshing counterpoint to “fake news”. The truth of the matter is that in this marathon called life you will receive the blessing of time and space to really focus on writing. However, in this phase, you will have to craft your messages in between many other important capers. It’s all good! Felicia, I love the idea of Golden stories which encompasses the wonder as well as the trauma. The constant dance of the daily To Do vs. creating art is also a constant theme in my life. Eventually, the kids grow and leave home but the dishes and laundry stick around. This is so wonderful, validating, and motivating. Thank you! And still you are called to struggle, not because it assures you victory, but because it assures you an honorable and sane life. This is an amazing summation of all the overwhelming feeling I feel as a single mom of three teenagers and aspiring writer. Great essay! This is what good writing can do. You held the hands of, and related to, women you’ll never meet. Thank you. Thank you Felicia! What a wonderful piece. You’ve helped me accept some immovable things about being a single mother, and not accept some other things, that is, not to lock up that gold. Something to share with you.. I’ve been trying an experiment lately of flipping the ratio of writing to housework, it used to be 1:4, now I’ve flipped it to 4:1 in favour of writing. So far so good, messy house, but I’m much happier – and the dishes do get done.